As a recently opened clinic we offer the highest standards of diagnostic capabilities. 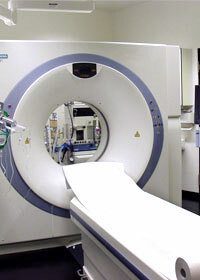 We use the newest medical technology like computer tomography, X-ray equipment for radiography and devices for neurophysiological diagnosis. Even more: our modern technological equipment enables us to provide patients with all important diagnostic and therapeutic means directly in our clinic! Even surgery is possible as our clinic has an operating theatre of its own. In this way we can shorten waiting periods for our patients.